Quilting with decorative stitches is a great way to add an accent to your quilt, especially along a border or in place of “stitching in the ditch” on a casual quilt. Some decorative stitches can be used with your walking foot, but only if the stitching always moves forward. Some decorative stitches can only be made when the feed dogs force the fabric to move backwards or even sideways. 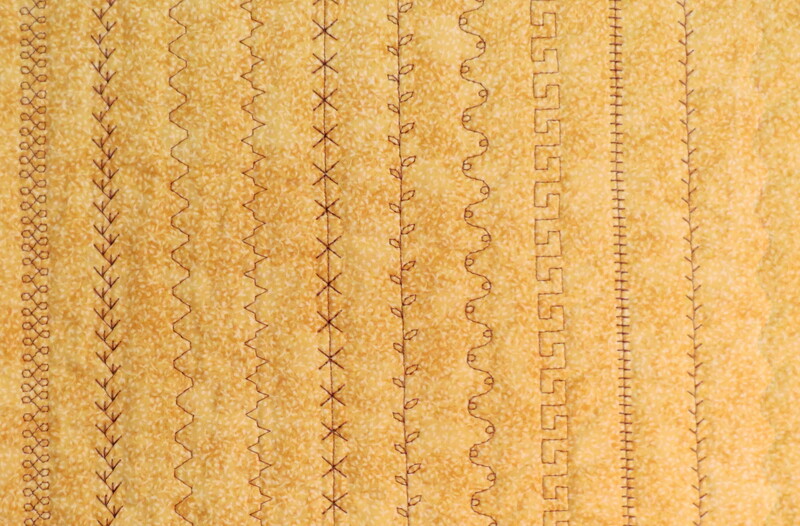 These stitches cannot be done with the walking foot in place, since the walking foot moves the fabric in the usual front-to-back direction only. For these decorative stitches, another presser foot must be used. 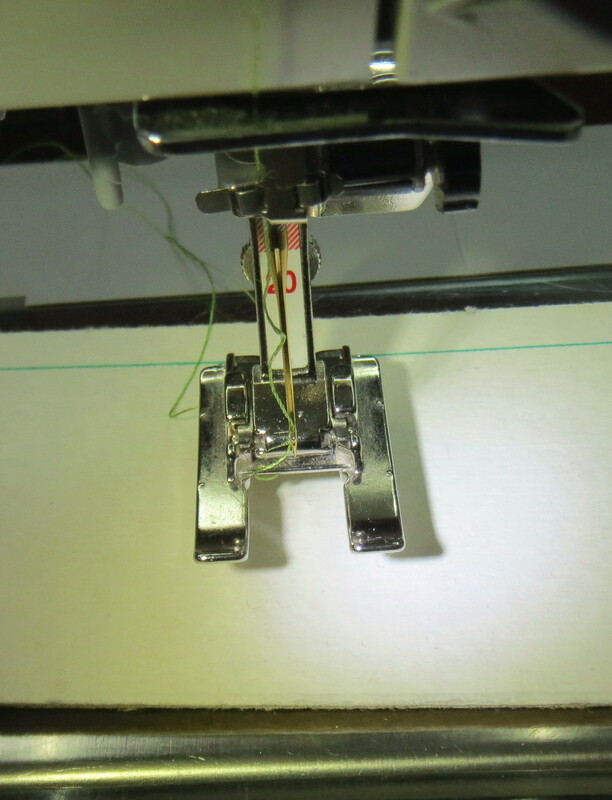 The best foot to select is an open-toed satin stitch or embroidery foot, such as the one shown below. 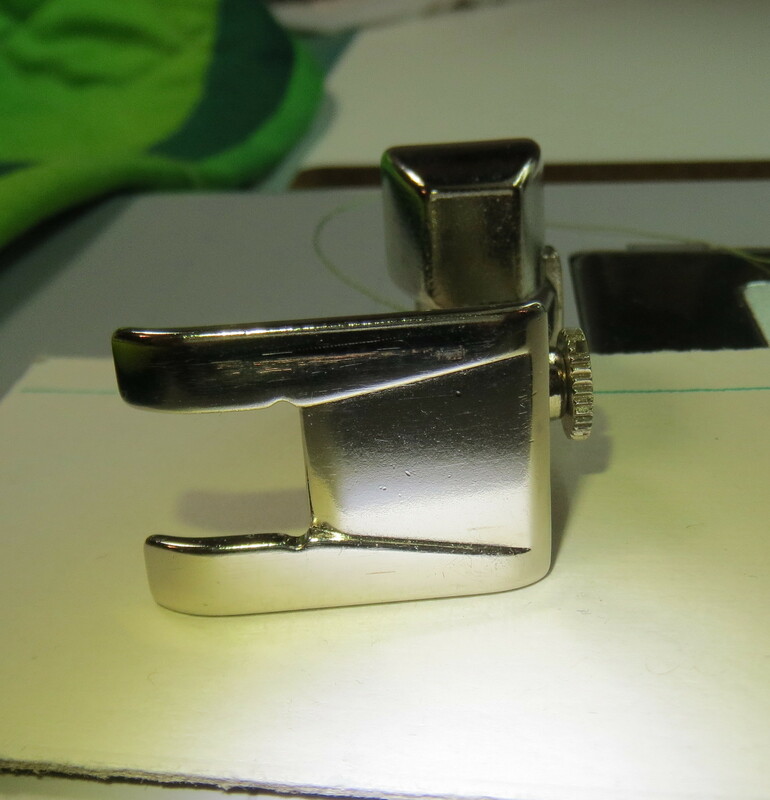 The photograph shows a Bernina foot for my machine that has a 9 mm stitch width; if your machine has a narrower stitch width, your foot will also be narrower. The embroidery foot can be distinguished from other feet by the groove on the bottom, shown in the right hand photo. The groove allows a dense stitch that stands above the fabric to move under the foot smoothly. Without the walking foot, the quilt top fabric will tend to be pushed forward relative to the batting and backing. Eventually when you reach a previously stitched line this will result in a pucker or fold. Avoiding puckers requires more careful pinning along the stitching line. 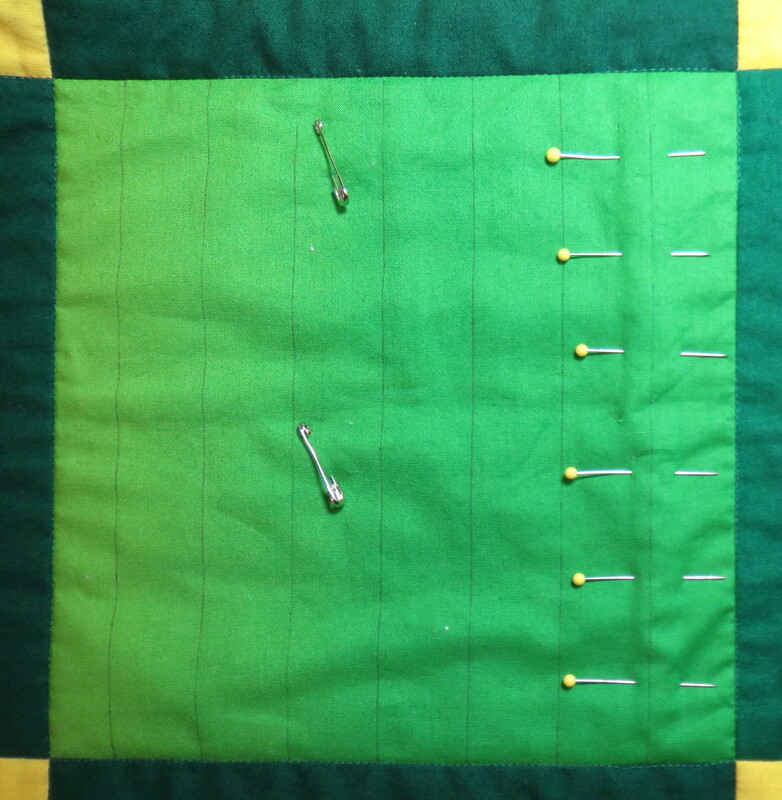 This can be done by pinning the stitching area for six inches or so ahead of the stitching, as shown in the photo below. I use large pins for this purpose so they are easy to pull out right before the needle reaches them. As they are removed, they can be placed further along the stitching line. 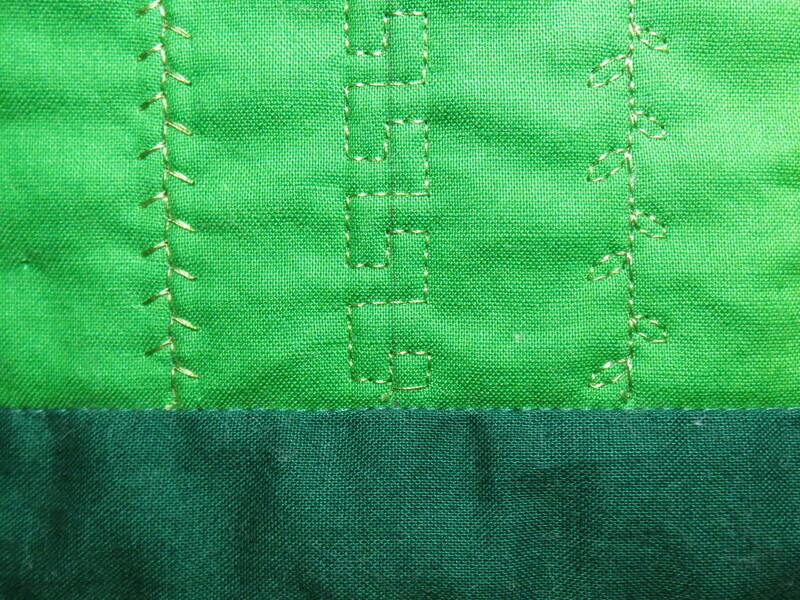 And below is an example of some decorative stitches I like for quilting. None of these stitches is very dense, so they are relatively fast to stitch and look good on the back of the quilt as well as the front. I particularly like the serpentine stitch (basically a wavy line), a simple feather stitch, and a simple leaf stitch. You may need to adjust the stitch width and length before they make an attractive quilting stitch. Be careful to check your tension on a scrap piece before stitching; sometimes the default tension on a decorative stitch is set loose so the top thread will go to the back and no bobbin thread will show on the top. Since we will be seeing the quilting stitches on the back as well, we need to balance the tension, especially if the top and bobbin threads are different colors. If I don’t want to take the time to bury knots at the start and stop, I ensure an attractive start and stop by first stitching 5 or 6 tiny straight stitches. Then I change to the desired decorative stitch and continue until I am within about a millimeter of the end. I then change back to a straight stitch and make a few tiny stitches. The closeup photo below shows this area; the straight stitching is not noticeable and provides the necessary locking of the thread so it won’t unravel. Try some decorative stitches on your next quilt. Several of them are great substitutes for stitching in the ditch, if you have trouble keeping your stitches in the ditch! This entry was posted in Quilting, Quilting Classes, Quilting with a Walking Foot and tagged decorative stitches, quilting on February 7, 2014 by Shirley at Mystery Bay Quilt Design. Thanks so much for the tutorial. I’m brand new to quilting, but want to one day use these techniques. I know this is old,but what the heck, I’ll ask a question anyway. When you start,do you pull the bobbin thread up to the top, like in most quilting and stitch those 5 or 6 stitches in place? I’m confused on how they get locked in to prevent unravelling. Good question! How you start and stop quilting is a matter of personal preference. More about options later. However, I will give you the short answer to your specific question first. For most decorative stitches, I prefer to start and stop with a very short straight stitch. The approved method would be to pull the bobbin thread up first. Then stitch 3-5 straight stitches at about 4-5 stitches per inch. Then change over to the decorative stitch and proceed with whatever stitch width and length you like best for the particular decorative stitch. At the end, reverse the process and end with several short straight stitches. How I actually start and stop on a particular quilt varies depending upon the quilt itself. Make up a test swatch for your own quilt and experiment with different techniques. When I am in a hurry to finish a quilt and I don’t think the recipient will know the difference, I probably wouldn’t bother to pull up the bobbin thread at all. I would just do the short stitches and snip the threads off front and back. For an important competition quilt, it’s hand buried knots all the way! When I use very fine thread (such as size 100 silk) there is no potential for thread balls on the back so again, no pulling the threads up there either. On the other hand, metallic or ribbon threads can be a real problem. With them you really must run some tests to determine what will work best. Of course the Quilt Police have their own opinions on my approach. Mostly they don’t show up to my house so I ignore them.